As the name suggests, drumasonic represents a high-end approach: A comprehensive virtual drum sound library with top of the line recording quality, flexibility and sonic versatility, developed with minute attention to detail, meeting the high standards required by professional drummers and mixing engineers. All signals were converted with high-end equipment directly after the preamps. The goal was to provide the discerning musician, sound technician or producer – in the sense of authentic drum miking – a variety of phase-coherent, freely combinable and routable signals out of a selection of distinct recording rooms. With its integrated high-end eects, powerful groove modifying, playing and recording features, a modular preset system, and many more sophisticated features, drumasonic will quickly reveal itself to you as a comprehensive drum software solution. The importance of maximum phase correlation – especially for multi-channel recorded drums – should not be underestimated: if the phases of such transient-rich signals cancel each other out, even the finest recordings will sound poor and thin. The meticulously optimized phase correlation of every signal combination among with the most responsive microphone preamps is one of the great secrets of drumasonics outstanding sound with its extraordinary impact and clarity. 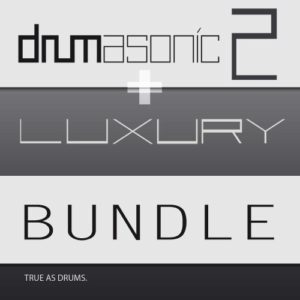 Drumasonic Luxury expands the Drumasonic universe with 3 bass drums, 2 snare drums, 5 toms, 3 hihats, 2 rides, 4 crashes, recorded in an extremely “pushing” room. 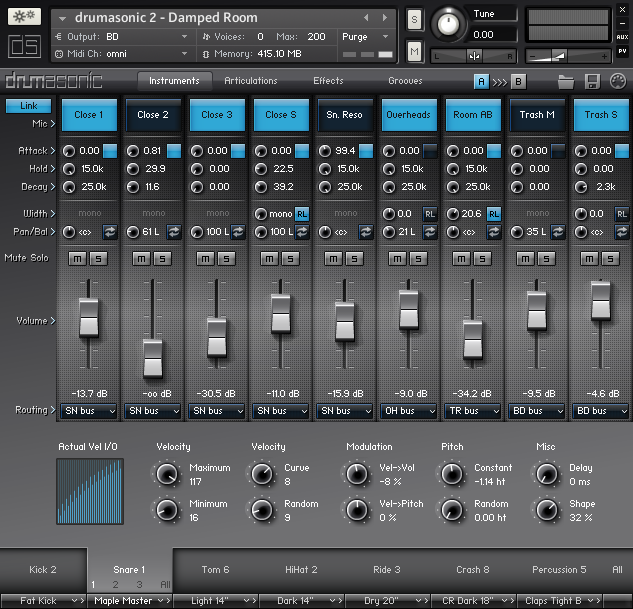 While it features the drumasonic 2.2 Engine, Luxury comes with its own Interface & more than 30.000 Samples! Drumasonic 2 comes with 3 bass drums, 6 snare drums, 5 toms, 4 hihats, 5 rides, 9 crashes and various percussion instruments, recorded in two different rooms. Two of the snare drums can be played with sticks, rods, or brushes and have true round robin samples. Great e-drum playability: enjoy natural-sounding flams, rolls, cymbal chokes and incredibly realistic hihat control. 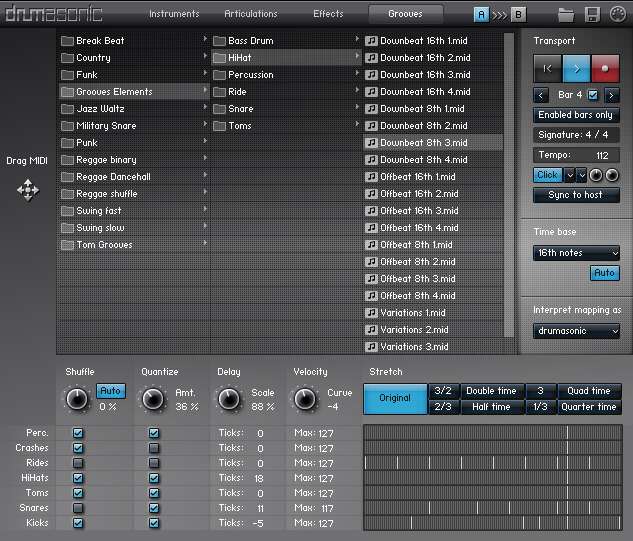 Built-in preset system: choose from a selection of pre-mixed drum kits, or create your own mix. Integrated groove player with extremely flexible and musical groove modification capabilities, providing shuffle, quantize, delay, velocity per instrument category and much more. Shipping with a groove library containing hundreds of production-ready grooves, fills, and percussion loops. The integrated mapping converter allows for seamless integration of 3rd party groove libraries. Versatile integrated mixing engine providing state-of-the-art effects, such as EQ, compressor, transient shaper, tape saturation, convolution reverb, delay, and master limiter. Superior phase correlation: no matter which mic signals you combine, drumasonic will always sound fat and natural. 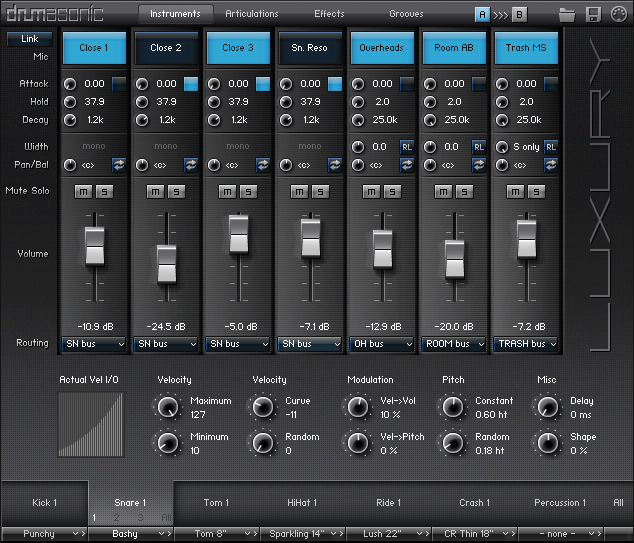 Streamlined interface: mix your drums faster and easier than ever before. Over 30,000 samples — more than 4 times the number of drumasonic 1.5. Advanced voice reduction technology and efficient purge features: deactivate unused instruments, microphones, articulations or beaters to save memory and optimize the performance. Unique drum kit, providing 3 bass drums, 2 snare drums, 5 toms, 3 hihats, 2 rides, 4 crashes, recorded in an extremely “pushing” room. Now including a third “bonus” snare drum! All included kits can be played with sticks, rods or brushes – with or without snare wires, with several round robin sets. Up to ten microphone signals per instrument allow for a virtually unlimited mixing flexibility and sonic diversity. Built-in preset system: choose from a huge selection of pre-mixed drum kits, or simply create your own mix. Shipping with a groove library containing hundreds of production-ready grooves, fills and elements. More than 30,000 samples, condensed into a streamlined user interface: mix your drums faster and easier than ever before.